Is it worth going to University? Is it worth going to university? This is the question that keep most 6-formers (and their parents) awake at night. Undoubtedly, higher education is an ideal that young people have been aspired for generations. However, the skyrocketing tuition fees and the increased graduate unemployment rate force most of them to get to grip with the new reality. There are many who make the case against going to university. They argue that there are better options to ‘learn and earn’ that don’t cost so much and provide equally good or even better long-term benefits (e.g. apprenticeships, short-term courses or on-line courses while working, entrepreneurial initiatives, etc). There are also those who make the case in favor of higher education. They firmly believe that people who go to university learn to think critically, to work in teams and they also get the opportunity to develop a social network that will be invaluable later on in their career. Even during recession, they have better chances to find a job that those who don’t have a degree. The truth though is that no answer fits all. In a previous post, I made the comparison that investing in higher education is similar to investing in property. In principle, the benefits of both investments are many. However, a positive return on investment (ROI) will be achieved only if you invest in the right property. Same principle applies for higher education. Prospects vary across subjects and universities. Hence, you need to be selective about what you study and where you study. Success will also depend on the effort you make during your university years. The more you are involved with your studies and extra-curriculum activities, the more you will get out of them. Don’t just go to university because you don’t know what else to do or because all your friends are going. 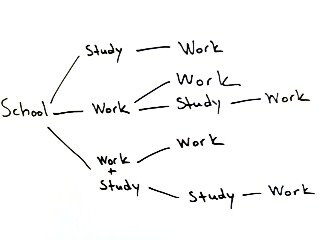 If you are not clear what you want to study, you will be better off to get some work experience under your belt first. Higher education has become expensive. If you decide to go to university, make sure it is worth your investment by studying a degree that fits your strengths and interests and will provide you with good career prospects. This entry was posted in b4iapply to college, b4iapply to uni, Higher Education, What to study and tagged how to choose what to study, to study or not to study, tuition fees, university applicants, what to study. Bookmark the permalink. 1 Response to Is it worth going to University?